Hi Friends! 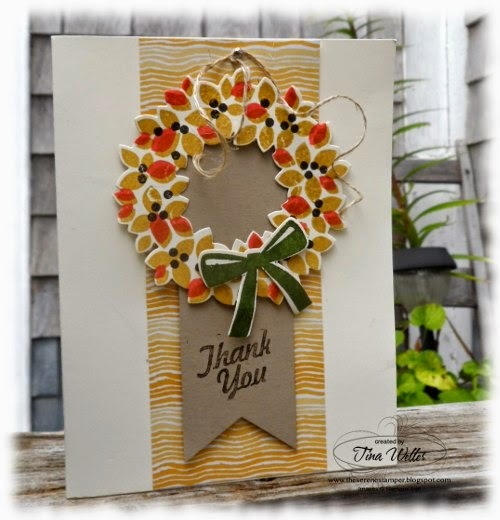 Today's card is a thank you card that I recently stamped for a customer who placed an online order. I really appreciate those of you who shop through my store and I love stamping cards to show my gratitude. Remember to click "Demonstrator can contact me" before you submit your order though, otherwise I have no contact info and therefore I can't send you a thank card (or email you the free PDF and video links for this month's projects!). Due to popular demand I am excited to announce that I am starting an online Project Life club where members receive free PL product! Email me at serenestamper@gmail.com if you would like more information. Full colour, step by step instructions for 4 cards, storage box for cards, curvy gift box, plus bonus projects in a PDF that will be emailed to you with a min. $25.00 online order on my site HERE when you enter the hostess code 4FQAZQ39 . Important - when you shop online be sure to click "Demonstrator can contact me" and include your contact information. Otherwise there will be no way for me to receive your name and email to send your PDF gift! Do you live in the USA instead of Canada? No problem! You can be a part of this too! Visit my "Passport Pal" at Frenchie's blog HERE. I'm off to Truro today and tomorrow for our Canadian Fall Conference - it's going to be a good time and I'll be sure to share photos with you when I get back. Until then, have a great weekend and HAPPY STAMPING!